The golf swing is an explosive movement where an average golfer uses over 90% of their TOTAL strength during one shot! How can you expect to be prepared for such an athletic event if you DON’T warm up? There is a tremendous amount of power used to propel the golf club forward on the downswing as well as putting the brakes on in the follow through. This equates to a lot of torque on the low back. Don’t warm up and you risk injuring yourself. Another good reason to warm up is because it can help lower your golf score. How many times have you teed off and felt unprepared and unsure of how your round would go? Are you confident? My guess is that you aren’t as confident as you could be. 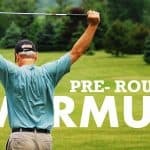 A good warm up routine can address all of these area’s and set your round off to a good start. Tee off last in your group and visualize your tee shot. Pick an aim point and visualize the ball flight and landing in your target zone. You can open the above file in a new window and save-as or right-click the link and select "Save Link As" to download the file to your computer. So how do we warm up properly for a round of golf? Well, there are a few methods I have designed for you to not only get the body going, but also your mind, and finally your swing. Feel free to change this Warm Up routine around and adjust it to your needs. I have based it on getting to the course late with just 15 to 20 minutes left before your tee time. First, the warm-up focuses on raising your core temperature. By raising your body’s temperature you will warm up the muscles and make them more pliable. This is done through a technique called Dynamic Stretching. Second, we focus on feel for putting. Distance control is the main enemy of most high-handicappers. So, I’ve included a few drills to get your speed down. I also encourage you to focus on knee knockers and gain confidence during the warm up. There is nothing better in golf than hearing the ball drop into the cup. Third, our goal is to continue to build confidence and help reduce the jitters many of us feel on the first few holes. I’ve discovered over the years that if I had been better prepared to tee off, I could have shaved valuable strokes! Dynamic stretching IS NOT static stretching. Pre-round, we should never do static stretching if we want maximal power. There are absolute boatloads of scientific research studies that have proven static stretching REDUCES STRENGTH AND POWER OUTPUT. 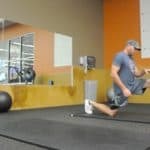 I’m not claiming that you are going to hurt yourself by static stretching or anything like that, but my preference is to smash the ball as far as I can – so I have eliminated static stretching for the most part. However, there are certain times when I get out of bed and I need a good stretch. If you feel like you need a good stretch, take it. I don’t think this is an all or nothing rule. Use your best judgment. The reason static stretching robs power is that studies show static stretching elongates your muscles and reduces muscle tension. This reduction in tension reduces tensile strength and effects your power delivery to the ball. A good analogy is to think of a rubber band that has lost its elasticity. There just isn’t as much pop to it as there once was.. So who wants to be a floppy old rubber band? Not me! TIP: Get a feel for the putting green BEFORE striking any full golf shots. My warm-up begins in the parking lot or at the golf cart, moves to the putting green, then moves to the driving range and finally ending up at the tee. After all, aren’t we going to hit a driver as our first shot of the round? Usually, I like to hit the putting green and hit a few short putts first. Nothing else builds confidence like the sound of the ball hitting the bottom of the cup. With this in mind, I start out with 3-footers and listen for the ball to fall into the cup. Once you gain a little confidence it’s time to get a feel for the speed of the greens. Speed is one of the most difficult aspects for most amateurs. Luckily, there are a few drills we can use to get a good feel for the speed that day. The “Draw Back” game is a good one that builds boldness in your stroke, and also helps you with shorter putts. Another drill I like to use to gauge speed is the “Two Foot Past” drill. Depending on how much time you have, you can use one or both. My personal favorite is the “Two Foot Past” drill because it’s quick and easy to develop your feel for the greens. Your aim for the range is to find a swing thought that helps you maintain tempo and deliver consistently shot after shot. It’s important that you find a swing thought that promotes a good start to the swing. Jack Nicklaus has written about imagining a “ridiculously slow” takeaway as a thought. Whatever your swing thought, keep it consistent and in the front of your mind when you address the ball during your round. A good swing thought can really elevate your game to levels you have never imagined. A cloudy mind is no good for golf. One thought also helps you to stay focused and not overthink the swing. Golf is hard enough as it is, we don’t need to complicate things. The main goal here is to find a good tempo that allows us to strike the ball without tension. Therefor, it’s never a good idea to start with the big dog out of the gate. The driver is hard to hit, and we usually lash out with all our power to try and hit the long ball. Not a good idea when we are trying to find a solid tempo that will keep the ball in the fairway. Let’s start with a pitching wedge or 8-iron to boost confidence. Confidence is often overlooked in golf, and we are building it in right here in our 17-minute dynamic warm-up. Grab your wedge or 8-iron and start hitting half shots. I’d like you to hit half shots as long as you would like, however, to keep your warm-up at seventeen minutes try to complete half shots in just a few minutes. Hitting half shots allows you to warm-up your nervous system to the chain of movements required in the golf swing. Start out nice and easy here as you are laying a solid foundation for your upcoming round. Just let your swing wind and unwind nice and easy – focusing on tempo. Don’t rush through this, we are trying to build a confident calm. When we rush or feel rushed, it affects our timing and ultimately ruins our swing. Pay attention to the distance your shots are flying. This is important information you can use when choosing your clubs for approach shots to greens. Finally, move on to full shots using the 8, 6, and 4-irons. Then move up to the Hybrid, 3-wood, and finally the Big Dog. Obviously, you can take more time if you need it. 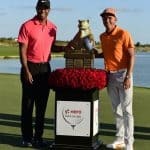 My goal was to give you a well rounded warm up that you can knock out in 15 to 20 minutes and be totally prepared for the round.